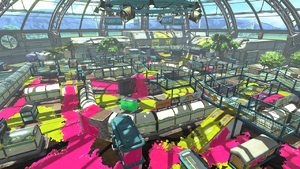 Kelp Dome is a greenhouse-themed multiplayer stage in Splatoon and Splatoon 2. Kelp Dome is shaped like a large square with rounded edges. It includes a variety of paths and ramps divided by uninkable glass containers, in which various plants are growing. A network of grated walkways are also found above the central area and some of its connecting path, allowing players to ink turf from above. On the ceiling there is a glass dome that covers the entire round-shaped garden. Unlike conventional maps like Urchin Underpass and Walleye Warehouse, which has both team's bases at far ends of the map and players clashing at the midpoint, Kelp Dome is shaped more like a donut. The Spawn points are situated on the outer rim of the map, which also envelops the central area. The spawn points are located on very high pillars with a large grate extending out from them, and there's a large raised area that players can only reach by dropping down from the spawn point. The large raised area is therefore not accessible to the enemy team. There are two paths leading away from the spawn point, one to the left and one to the right, while in Ranked modes there is also a third, direct path leading to the central area through the newly-added metal box. The area behind the spawn also has a ramp that leads out into the left path. Going down the left route is a small, square area, with a narrow opening leading into the neutral combat area and a ramp going over the wall and on to the map's network of grates. On the right is an enclosed area with two ramps leading out of it. One connects to the grate passages directly above the central area, while the other is a one way drop into the corner regions. These two corner regions are where players of both teams meet when they leave their bases without using the grates. It is a simple square area with simple cover and an inkable wall that allows squids and octopi to swim up on to the grate network. There is also a wide path leading into the middle region. The grate runs above this path, branching off into either team's inner base. At the center is a wide open area that is broken into halves by a tall cylinder in the middle, with two arms extending out from it. The entire structure can be inked so that players can get on to the platform from below. It is also where the grates on either side of the map ends, making it yet another way to reach them. Two inflatable barriers are placed in either corner of the area for cover. There isn't any water or abyss in this stage. Kelp Dome in different terrain. The zone is located at the center of the map, surrounding the tall cylinder, and is in the shape of a square. In order to capture the zone, both the part on top of the tall cylinder and the part below it must be inked. Ink-able blocks have been added just ahead of the spawn point, allowing players to get over the otherwise uninkable glass containers for a shortcut into the center area. In Splatoon 2, ink-able blocks have been added to the left of the spawn near the grate network to get over the uninkable glass containers towards the corner of the dome. In Splatoon, the tower starts on top of the tall cylinder at the center of the map. It moves down and to the right of the tall cylinder, towards the corner of the dome. It then goes straight towards the opposing team's spawn point and finishes right below the inaccessible area of the opposing team. Ink-able block have been added from left of spawn point to get over the uninkable glass containers for a shortcut into the center area. Many small objects in the corners of the dome got removed to make way for the path of the tower. In Splatoon 2, new object was added to the left of the center area to provide cover. The first checkpoint is located just off from the central platform. The second checkpoint is located at the choke point leading into the enemy's spawn area. The third checkpoint is left of enemy's spawn at the middle of the big areas. The Rainmaker starts on top of the tall cylinder at the center of the map. The goal is located in front of the spawn point of the opposing team next to the wall. Barriers have been added onto the raised walkways so that players cannot take that walkway right after obtaining the Rainmaker, or attack the opposing team before getting the weapon. ink-able block have been added to the left of spawn near the grate network to get over the uninkable glass containers towards the corner of the dome. Barriers have also been added near the spawn point for cover and got removed in Splatoon 2. The Basket is located on the left side of spawn near the ramp while the bump of the goal is infront of the spawn point. Ink-able blocks have been added to the left and right routes from spawn to create a raised walkway above the uninkable glass containers, ink-able blocks have been added in the region corners of the dome to get cover behind and climb over them. 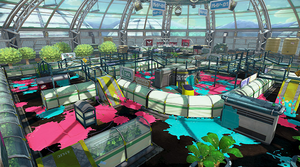 Kelp Dome was released on 11 June 2015 at 02:00 UTC, Modified Kelp Dome takes place on Octoling Invasion, an Octo Valley mission. Small adjustments were made for Rainmaker mode. Fixed an issue in all game modes that allowed players to move inside the raised starting platforms. An Inkling looking over the field during Splatfest. An Inkling in Kelp Dome during Splatfest. An Inkling launching over the field. An Inkling falling towards the ground. The area outside the boundary of Kelp Dome, with a jellyfish tending a tree. More of the outside area, with another jellyfish walking around. A group of gulls seen outside Kelp Dome. An Octoling at Kelp Dome during the Octoling Invasion mission. Concept art of various objects at Kelp Dome. Kelp Dome was released on 16 September 2017 at 02:00 UTC. returning from the first game, featuring extra grates and turf. The changes made are expansions to the grated walkways to the side of the map and ramp in front of base. Some small boxes have been added as obstacles but the map is largely unchanged from its original counterpart. Kelp Dome underwent renovation, small changes in each mode to prevent camping. Added a second bump to the basket in Clam Blitz. Changes made to object placement in all modes. View from spawn at the center. Grates from right side of spawn to the center. The center of Kelp Dome. A sunset variant of this map exists in Octo Valley in the mission Octoling Invasion. This was the only way to play on Kelp Dome before the map was added on 11 June 2015 . Regarding the sisters' conversation where Callie states ink is good for plants, Marie responds with "seems legit", an Internet meme used sarcastically by people who don't believe a claim to be true. In reality, cephalopod ink does not contain any compounds that significantly affect plants one way or the other. However, coated leaves may be unable to photosynthesize, making ink potentially bad for plants. When Super Jumping, the glass dome disappears for a brief period. Right before a match ends or Overtime begins, wind chimes can be heard. Kelp Dome, Walleye Warehouse, Ancho-V Games, Musselforge Fitness, Humpback Pump Track, MakoMart, Shellendorf Institute and Goby Arena are the only stages that are not located outdoors. This is the third map from Splatoon to return as a stage for Splatoon 2, with the first two being Moray Towers, and Port Mackerel. An intro to the stage with Off the Hook shows that Marina asked Pearl one time if the Kelp Dome grows wasabi, a reference to how DJ Octavio uses wasabi stalks during the battle with him in both games' single player modes. According to the first artbook, the owner of Kelp Dome is called Grammie(NA)[a] / グラミィ(Guramī)(JP)[b]. The facility mainly grows fruits and vegetables, where fruits have become popular among Inklings in recent years. The internal codename for this stage in the game files is "Maze". Kelp Dome is derived from the nouns Kelp and Dome, Kelp are large brown algae seaweeds and Dome is an architectural element that resembles the hollow upper half of a sphere. モズク農園 Mozuku Nōen is derived from Mozuku and Plantation, Mozuku is a type of edible seaweed and Plantation is a field to grow crops. This page was last edited on 17 April 2019, at 16:28.